Les Misérables: Or, When Will Someone Set The Industrial Revolution To Song? With today’s nationwide release of Les Misérables I booked my ticket and hurried off to my local cinema, excited to catch ‘The Best Film Of The Year’ – which is high praise indeed as it is only January. The film adaptation of the world’s longest running musical has a lot to live up to: a dedicated fan base more judgmental than any twihard, and reputation for having attracted some of the biggest names of stage and screen to its banner. For the film, the title roles have also hooked some of the shiniest lights of Hollywood. Hugh Jackman as the redemption-seeking Jean Valjean, Russell Crow as the single-minded Javert, Anne Hathaway as the desperate Fantine, and Eddie Redmayne and Amanda Seyfried as the young lovers, Marius and Cosette. It also has a great supporting cast that includes Helena Bonham Carter and Sacha Baron Cohen. I was apprehensive to see just how well they would manage to fill roles that, to me, were best linked to the brilliant Alun Armstrong, Colm Wilkinson, and Ruthie Henshall. Well, it turns out that apprehension was a wasted emotion. The opening sequence is a moment of cinematic wonder. As the prisoners pull a tall ship into dock the physical power of the sea, and the nineteenth century, is utterly breathtaking. 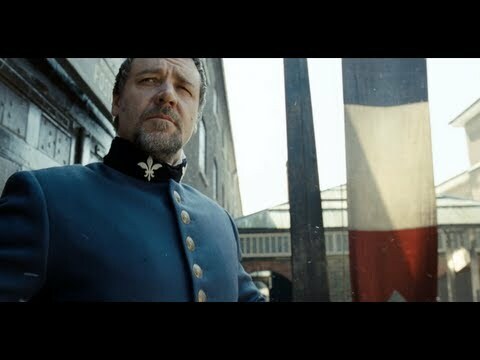 Russell Crowe hasn’t looked this good near a boat since Master and Commander. Then Hugh Jackman opened his mouth and my heart sunk. He has a very good singing voice, but for anyone who knows the 10th anniversary DVD off by heart (I’m not admitting to anything), it was a complete rip off of Colm Wilkinson’s performance. But it turns out that that’s okay, because guess who turns up later as the life saving Bishop Myriel…? Yes, it’s Colm Wilkinson, Les Mis fans rejoice! Both Jackman and Crowe turn in decent roles, with Anne Hathaway the standout performance of the entire piece – the sooner someone gives that woman the Oscar, the better. The surprise success of the film is Eddie Redmayne, who should really sing all his future roles as it allowed him to display great emotional depth and accuracy, something that has been severely lacking from any of his recent performances (even if he does suffer slightly from ‘wobbly jaw’ syndrome). Amanda Seyfried is quite good, and will always have my respect for her ability to hit notes that only dogs can hear. So all in all, I thought it was brilliant. The cinematography and the costumes were great, the score and lyrics were faithfully transferred to screen and recreated the same power and intensity of the stage adaptation. The only downside was a lacklustre performance by Bonham Cater/Baron Cohen. The Thenardiers are supposed to be evil, awful excuses for human beings. Instead they just came across as slightly bored. Also, don’t forget, it doesn’t matter where you are in the world, street urchins will always be from the East End of London. So, what about the original masterpiece that has inspired this film? Where does the book fit in our ideas of nineteenth century life? Victor Hugo’s original novel, first published in 1862, covers the themes of revolution, love, despair, redemption, and tragedy in equal measure. It was translated into English in the same year, by Frederic Charles Lascelles Wraxall, and published by Hurst and Blackett. Referred to in the English press as Hugo’s ‘great work’ it captured the imagination of the Victorian world. Hugo had been inspired by his own experiences of the June Uprising in Paris, 1832; he had witnessed the barricades and the men and women behind them. But it was not until the 1840s that the rest of his characters began to form. In 1841, Hugo witnessed a dandy pick up a lump of snow and throw it down the back of an unsuspecting women who ‘uttered a cry indicating sharp pain’. The ensuing fight, and Hugo’s defense of the women to the police inspector, are recreated almost word for word in the dénouement of Fantine’s fall. The character of Jean Valjean was heavily influenced by the life of reformed criminal Eugene François Vidocq, from whom Hugo took Valjean’s great strength, and quest for redemption. Although the literary élite responded with some negative reviews, Hugo’s great epic was as socially influential as Charles Dickens’s texts in recreating the underworld for the reading populace. In 1884, The Freeman’s Journal and Daily Commercial Advertiser, Dublin, published a collection of articles titled ‘The Great Public Scandal’ , similar to the ‘Outcast London’ series by the London newspapers, decrying the state of the poor in Ireland. It listed Dickens and Hugo’s work as literary representations of the realities many faced in their daily lives. But why did Les Misérables continue to connect so deeply to its readers twenty, thirty, or a hundred and fifty years after its first publication? I think its themes transcend the novel’s setting. They are constant battles fought in every society across the world. The desire to make the life you live better, whether that is due to political change, money, power, or love. One of the most interesting things about Les Misérables is that it has existed in cinematic form for over one hundred years, first adapted to screen by the Lumière brothers in 1897, and again in 1907 by Alice Guy-Blaché, one of the earliest, if not the first, female directors of silent film. Has this connection to the visual maintained a level of mainstream interest in Hugo’s work? Or is it just that his writing has translated so well into other media that they appear almost timeless? Whatever the reason, his work has withstood the test of centuries, and leaves me wondering – what else should get the Les Misérables treatment? Bleak House: The Musical? Gaskell’s North and South: The Comic Opera? And after Danny Boyle’s epically dramatic reimaging of the Industrial Revolution for the Olympics, isn’t it time someone set that to song? What about 1887’s Bloody Sunday, which was preceded by smaller skirmishes including a mob ‘…led by the scarlet flag carried by a youth, the men trooped across the Park in the direction of Victoria Gate, singing the chorus of a song which the demonstrators had done their best to make popular’. Hmm…maybe I should give Cameron Macintosh a ring? So, if you are a fan of the original musical then the film shouldn’t disappoint you, and if you are a fan of the nineteenth century, social revolution, redemption, and love, then it should also float your boat. If you are a devotee of Victor Hugo, then…well hopefully you’ll be excited by a re-imagining of his work. And remember, as Jean Valjean utters in his last line, “To love another person/ Is to see the face of God”. You have put pen to paper and written what I wanteed to say about the film. I, too, memorised (and wore out one copy of) the 10th Anniversary DVD. I have been reading many disertations (sp) on the Movie…some good, some stupid. And then I come across yours…Thanks.